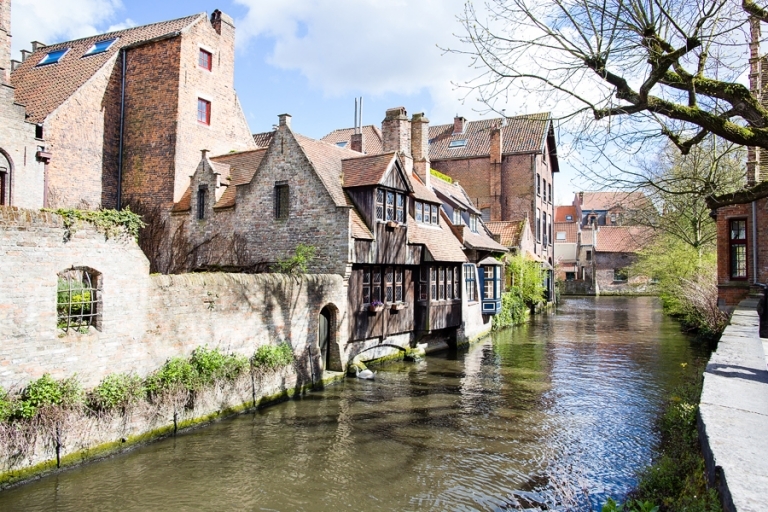 When I pictured our springtime visit to Bruges, Belgium, I imagined bright blue skies with puffy white clouds, a crisp breeze, and not a drop of rain. I know that was wishful thinking for Europe in the spring, but I was hopeful for perfect weather! I planned my entire suitcase around temperatures in the upper 50s/low 60s: long-sleeve tops with a cute mid-weight field jacket. As our late April trip drew nearer, the more accurate forecast promised very chilly days in the 40s with a considerable amount of rain. We did get my blue-skies-with-puffy-clouds weather in small doses, but mostly we needed winter weather clothes, a waterproof outer layer, and umbrellas. We are no strangers to working around the weather though. 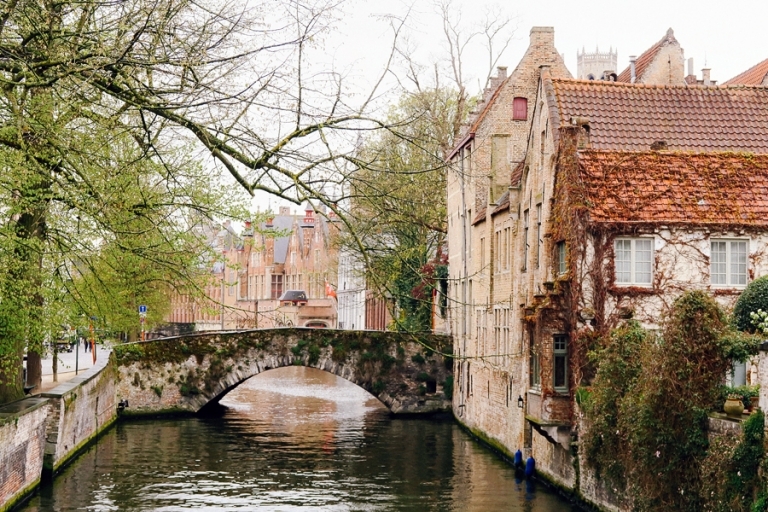 Here’s what we did with our three days in Bruges based on rain or shine. 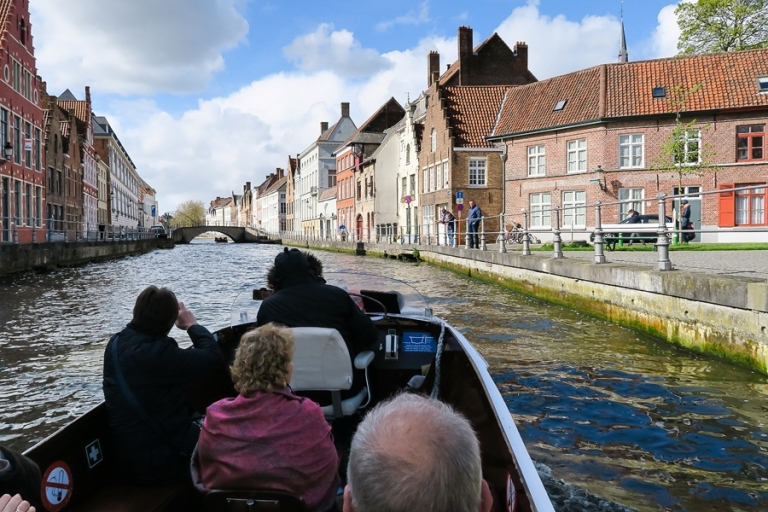 First of all, if you have about thirty minutes of clear weather while in Bruges, I highly recommend the canal tour. Most reviews seem to agree that it’s a little on the cheesy side, but that it’s a good kind of cheese. We loved it! 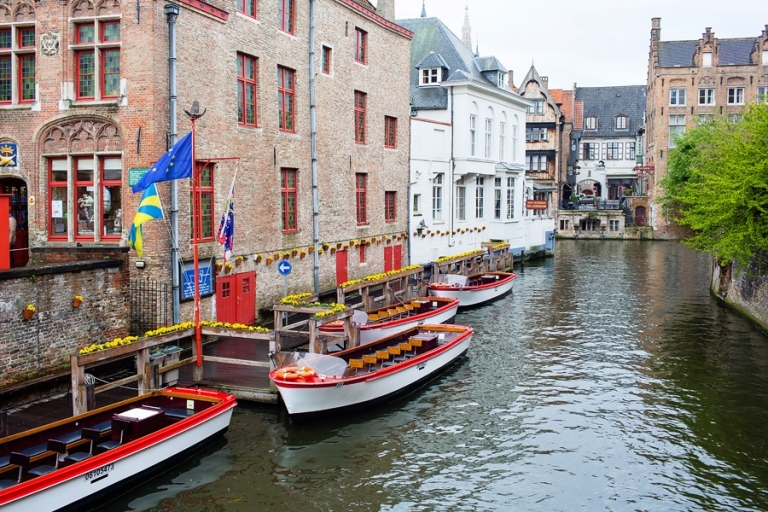 It was a great way for us to get to know the city and to see some areas only accessible by boat. And of course, there’s historical Markt Square in the heart of the city where we gazed up at the Belfry tower and the Provincial Court building, a former government meeting hall now used for ceremonial activities. Horse-drawn carriages awaited passengers in the Markt for those who preferred another vantage point while touring the city. We didn’t take a carriage ride and I’m still trying to learn more about the animal ethics on that, but as a side-note, I was happy to hear from a local that the Bruges horses are treated well with mandatory breaks by law and they aren’t permitted to work multiple days in a row. My other favorite fair weather activity in any area is to wander around with my camera and discover interesting details. I admit I’m not consistently good about toughing out the rain or cold when it comes to photography, especially if I’m not prepared outfit-wise. There were a few times in Bruges where I wished we had packed base layers and ski coats! Thankfully we had plenty of clear and warm-ish moments throughout our visit for photo ops. But we also had several moments where the skies opened up on us. The combination of rain and blustery wind with temperatures in the 40s had us ducking into the nearest establishment offering the slightest bit of cover and warmth. And what better way to warm up than with Belgian beer? Popping into random bars/pubs was hit-or-miss for us since several businesses were closed on Sundays and/or Mondays (do your research in advance if a particular restaurant/shop/pub is important to you), but we did score with a few places. First, we hit up The Bottle Shop where Chris purchased several local Belgian brews. If you love beer, you have to check it out – the selection is pretty fantastic. A local recommended a few bottles to us and Chris enjoyed sampling them throughout the week. Next, we toured the Brouwerij de Halve Maan, and we recommend this tour regardless of the weather. 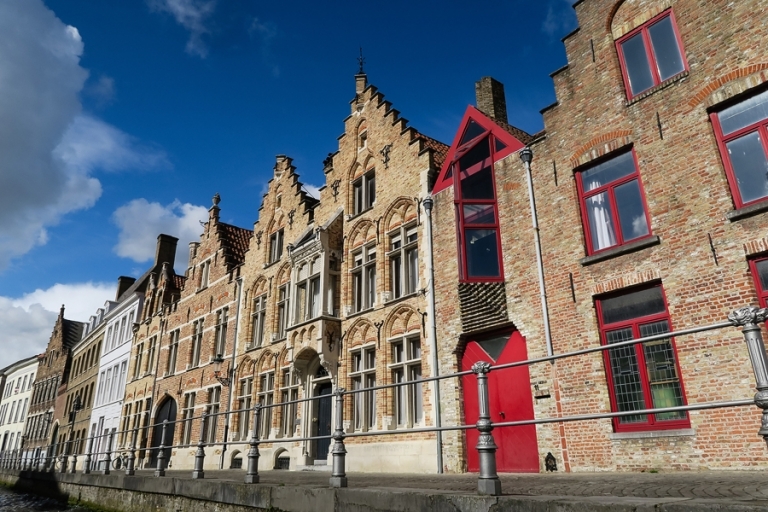 It’s the only remaining working brewery in Bruges, and if you select the XL tour at 2pm (19 euros per person), it includes a premium private tasting with three beer selections. We especially enjoyed the Brugse Zot. The weather happened to clear up just in time for the rooftop view portion of our tour! Speaking of views, another rainy day activity idea is a self-guided tour of the Belfry. Chris and I spent a rainy morning climbing the 366 steps of the tower for spectacular views of the city. This is also a great way to work off those beers, chocolates, frites, and waffles. I can only recommend doing the climb before the beers though – the steps are steep and winding! You’ll want to have good footing here. The skies even started to clear on our way back down the steps. Mother Nature simply couldn’t make up her mind, except that she wanted it to be cold in April. So very cold. Because we spent so much time eating and drinking, we only ended up having time for one museum while in Bruges. If you find yourself in the same situation, I recommend a visit to the Kantcentrum where you can watch a live demonstration of the art of lace-making. The museum is located a little out of the way, but it’s worth the walk even in the rain. I loved watching the skilled ladies demonstrate this rich tradition with such speed and dexterity. It’s truly mesmerizing. Lastly, there’s always chocolate, which totally counts as the perfect rainy day activity in my opinion. In addition to sampling several chocolatiers, we treated ourselves to fresh, warm waffles covered in real melted chocolate from Oyya (our favorite). After one bite we didn’t care one bit that it was cold and rainy.